A derivative work by Judson Wilson, 5/22/2014. Adapted (with significant improvements and fixes) from the CVX example of the same name, by Joelle Skaf, 4/24/2008. where \(Y\) is the sample covariance of \(y_1,\dots,y_N\), and \(\alpha\) is a sparsity parameter to be chosen or tuned. A = np.random.randn(n, n)  # Unit normal gaussian distribution. A[scipy.sparse.rand(n, n, 0.85).todense().nonzero()] = 0  # Sparsen the matrix. Strue = A.dot(A.T) + 0.05 * np.eye(n)  # Force strict pos. def. # Create the covariance matrix associated with S.
# Create samples y_i from the distribution with covariance R.
# Calculate the sample covariance matrix. # The alpha values for each attempt at generating a sparse inverse cov. matrix. # Solve the optimization problem for each value of alpha. # Create a variable that is constrained to the positive semidefinite cone. # native sum function, which is compatible with cvxpy, to compute the trace. # TODO: If a cvxpy trace operator becomes available, use it! # If the covariance matrix R is desired, here is how it to create it. # Store this S in the list of results for later plotting. 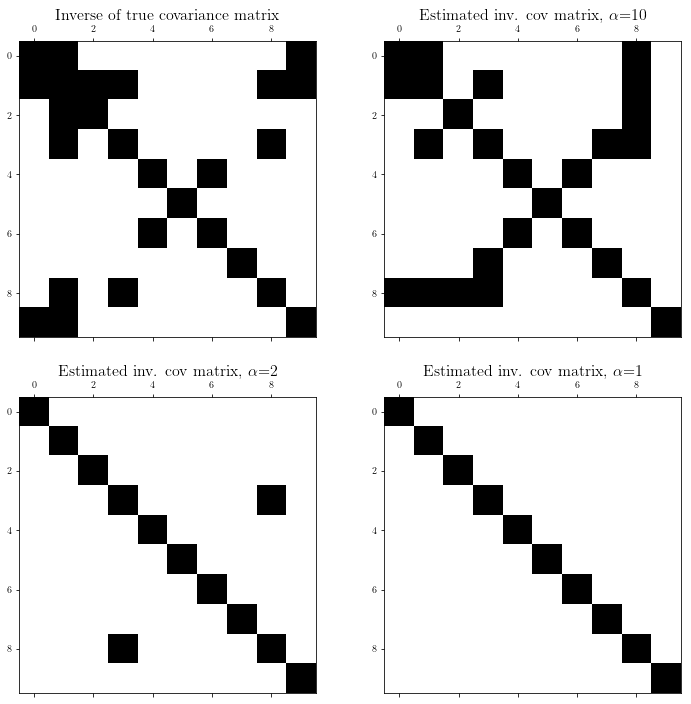 # Plot sparsity pattern for the true covariance matrix. # Plot sparsity pattern for each result, corresponding to a specific alpha.